In the 2009 European Parliament elections, the Green Group of MEPs won 13 more seats to become the 4th largest group. However when the European Parliament faces elections again in 2014, the political environmental will be vastly different. How to the Greens repeat their success of 2009 in such a situation? The Green European Journal talks to European Green Party Co-Chair Reinhard Bütikofer about his plans. Green European Journal: On November 14th the European Trade Unions organised a day of action against austerity. It showed once more the north/south divide inside Europe. The European Green Party supported this action. Can you explain this choice and how you understand this movement? Reinhard Bütikofer: I met the demonstrators on Place Schuman in Brussels with Isabelle Durant MEP and a small group of Belgian greens. The demonstration there was rather symbolic. But it was different in other European cities, mirroring an increasingly deep division inside the EU through the spectre of trade unions, although we might have expected that trade unions could bridge the gap among the governments. But it was not the case. The crisis of cohesion goes very deep. For the Greens who have always portrayed themselves as a new political force that gives new orientations, the challenge is to be able to help to bring the two sides back together. 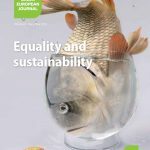 At a meeting of the European Green Party leaders in the European Parliament in October, there was no real agreement between the Spanish leader of Equo saying that the Greens should be in the streets demonstrating with protestors and the Finnish representative who basically said ‘look, there has to be some austerity after all’. Eventually we provided a common understanding by using the formula that we should pursue solidarity and solidity and sustainability. By putting solidarity first, we give a clear signal where our heart is and what should take priority. But by using the word solidity, we indicate that we think that solidarity will need a companion: reforms are necessary. I’m not saying the reforms that the Troika is advocating in the case of Greece. But just saying ‘no to austerity’ is not enough of an answer. We have to also provide a green reformist perspective. In Athens, I discussed with the leader of Democratic Left of Greece who basically argued that there should be more reforms in Greece, abolishing some of the traditional privileges of certain segments of society and creating more justice and fairness and that on the other hand there should also be an easing of the fiscal measures, reducing the burden on the broad population and most notably on the poor. The third aspect of the formula is that we include sustainability, something that neither the governments nor the traditional left talk about. This alludes to the basic understanding that all greens share that a way out of the crisis can only be forged on the basis of a new economic dynamism that would be built on what we have described with the slogan of the ‘Green New Deal’, which is an integration of environmentally oriented economic innovation and reregulation, a strong social plank and a macro economic regulation, particularly a re-regulation of the financial markets. In theory these three terms indicate the elements for a strategy. But our weakness is that our member parties do not talk to one another enough. There is very scant exchange between the Portuguese, the Spanish or the Greek experiences and the Nordic experiences or the German experiences. It is not enough to meet twice a year at European Green Party Council meetings. Unless we start working on those divisions much more actively by promoting bilateral exchanges between the parties we will not be up to the challenge of imposing a common answer. But just saying ‘no to austerity’ is not enough of an answer. We have to also provide a green reformist perspective. In the 2009 European Parliament elections in Belgium we were really successful with the Green New Deal not only because it was allusive to the memory of the welfare state but also to the aspect of ‘deal’, as the result of negotiations. Shouldn’t we focus more on this side and identify our partners, and on top of it, what we call in Belgium the ‘social partners’? RB: In 2009, the GND was indeed a very potent political instrument at least I can say that for Germany. In the debates, I was the only one willing to talk about jobs while all the other politicians from the traditional parties were reluctant to even mention that because their economic theories had all just been proven wrong. It was very useful to be able to say that the Greens have an integrated approach that brings together different aspects of what we have to deal with in this crisis. The Green New Deal has however, in the years since, not caught on much beyond the narrow confines of the Green family. The Green parties like the GND agenda, but few pursue it as an agenda. The problem is that if you do not put a lot of effort into promoting a strategy, you will not be successful. Had we not been extremely persistent as European Greens and particularly as German Greens in opposing nuclear in sunshine and rain and thunderstorm and always sticking to that clear agenda whether it was popular or unpopular we wouldn’t have been able to make this a brand mark of the Greens. With the GND, we have not showed that same emphasis and that same eagerness. So for instance, with the trade unions it has not resonated, as far as I can say. In Belgium, when Jean-Marc Nollet, our current Green minister in the regional government of Wallonia, published his “Green New Deal” book, it was well received by the Unions. RB: Maybe we should all learn more from that experience. But on the broader scale, that has not happened and that brings me back to your question ‘who is there to negotiate’? On the side of business and industry, there are obviously some forces that do see a certain potential in the GND and that would go for an innovative and progressive economic agenda and this now includes actors far beyond the traditional ‘green’ sectors. But I also see a structural conservative turning back while on the other hand the bridge between the ecologist community and the traditional social forces has just not been strong enough to really make us part of an alliance of actors that could play a role in such a deal. So basically our role was to be a kind of environmental minded consultant offering his business advice for actors that are reticent to go by the advice. This means that the Greens have to change their self-definition. Even if we had always a very strong social plank we have not been able enough to integrate our environmental and social agendas. But this is not tantamount to saying ‘let’s try to start copying the radical left’. This will need a lot of creative thinking and to avoid the traps of some of the old fallacies, like a really much misunderstood left Keynesianism would be a solution. Indeed, some Greens are critical of the GND concept because they identified it as too Keynesian. RB: Obviously, for the European South, a Keynesian understanding of the GND is not going to work. Where is the public budget to be spent on GND investments? So we will have to tackle the issue of financing the GND beyond just relying on possible public spending, like the German financing mechanism for the promotion of renewable energies, the feed-in tariff, which is being financed by the consumers or the European Trading System for C02 emissions. The credibility of the Green New Deal hinges a lot on whether people believe that the financing can be there for such a strategy. Thus we should maybe highlight the reduction of harmful subsidies, in particular for fossil fuels. The fact that we are lacking tax justice throughout Europe is being employed as a weapon against solidarity. In Germany, the conservatives have asked why should average German tax payers bail out the prosperous Greek Dentist who has been smart enough to avoid paying taxes. But before such pragmatic solutions, shouldn’t we first address the feeling of injustice that is currently so present throughout Europe? RB: In all the Member States, there is a very strong perception of lack of justice. The GINI coefficient has increased for all Member States, considerably over the years, also in Germany. There are two possible strategies to tackle this challenge. One is from the perspective of tax policy. The German Greens have developed a concept of property levy that we want to introduce if we get into government next year. It is supposed to raise revenue of €100 billion over 10 years from the wealthy. and I have been advocating that we should put that front and centre in our Bundestag campaign in 2013. Even though the members and voters of the Greens may be the first to pay? RB: Well, this levy would burden the 1% and I do not think the Green voters are necessarily the part of the 1%. But even if that would be the case, I would argue that the typical green members are different from people with a similar income who would be members of the German Liberals or German conservatives by having a very strong social involvement and a sense of justice that prevails throughout society. I recall a poll in which people were being asked what is the greatest problem confronting Germany and surprisingly the number of people answering that social division was the greatest problem was four times higher among green voters than social democratic voters and double as high as with left party voters. So we should not at all be afraid of making tax justice a core campaign issue. The fact that we are lacking tax justice throughout Europe is being employed as a weapon against solidarity. In Germany, the conservatives have asked why should average German tax payers bail out the prosperous Greek Dentist who has been smart enough to avoid paying taxes. So it has been used as a chauvinist tool to put people against each other. Thus we need tax justice not only from the perspective of creating more equality and more social inclusion inside our societies but also to fight against divisive strategy that you find in many Northern countries. RB: Indeed, one of the major strategic failures of the European left has been to reject Jacques Delors’ offer when he was constructing the common market to also create a social Union. Everybody felt that they would be better off if they were just allowed to stick to their national social mechanisms and social protection schemes. And it turns out that this has been terribly wrong, even if, as far as I know, in the polling of Eurostat, the opinion prevails that the major social protection systems should remain national. In Sunday’s sermon, there is a lot of talk about ‘social Europe’, but during the week, people do not want to implement it. Of course it is also obvious that some of these social systems are creating better results. So the Scandinavian model is broadly speaking creating better results with regard to justice than the continental European German and French models. To focus on public infrastructure and on public goods creates more social justice than focusing on individual social transfers. But it will be extremely hard and particularly under the present crisis to create a vast agenda for a new social Europe. Therefore we should rely on youth, which more mobile than others and which is more willing to experiment with new ways. This is why I have proposed that in the next EGP Council we should focus on youth issues and try to move beyond the conventional social democratic ‘blah blah’ about ‘ youth guarantees’ that de facto guarantee nothing to no one. Considering the level of youth unemployment in many European countries there seems to be an absolute necessity to be much more creative. There is for example a proposal of the Belgian philosopher Philip Van Parijs to create a small European basic income. RB: I agree with your general thrust but I am reluctant with regard to the basic income idea, when I was still Chair of the German Greens we worked a lot on that discussion and in 2007 we had a party conference that focused almost exclusively on that topic. That was a really interesting congress by the way. RB: Yes it was. But we came up with a different solution. We integrated some of the ideas of basic income approach into a “guarantist” strategy that focuses primarily on public institutions and not on transfers. I still think that there is some room for conceptual flexibility but so far I’m not convinced that the basic income idea as such in its pure form could provide a solid basis for the future. Again I would argue that maybe we should not bite off too large a piece of the cake. The Basic income is a bit posing all the questions of social cohesion at the same time. We should really focus more specifically on the youth or maybe a ‘European plank’ in the unemployment systems. It is in the last electoral platform of the German Greens for the European elections 2009 and we will again, I hope, try to promote that in the next election, despite the fact that in the working class there is not a spontaneous attraction towards proposals that have a clear solidarity character.